One of General Howe’s early toy soldier street installations. Photo by General Howe. General Howe, the artist who designed the cover of this book, has being doing street art since the summer of 2007. He is perhaps the clearest example of an artist going from making more or less traditional street art to fully-digital organic viral art while still trying to appeal to the same audience. 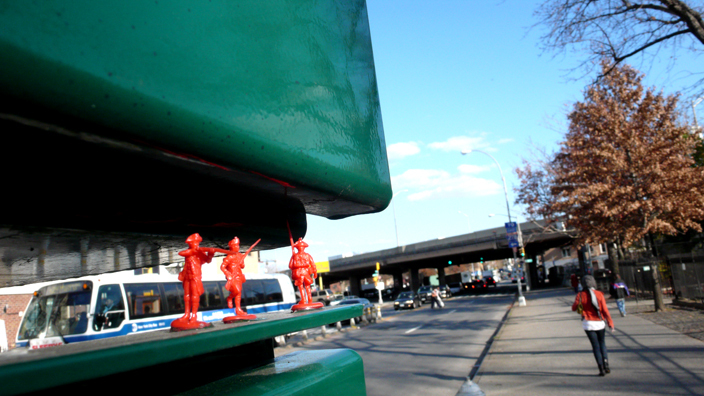 He became known for installing little plastic army men around Brooklyn, and he’s also done some wheatpasting. More recently, General Howe has transitioned from street art to making animated GIFs and posting them to his Tumblr. He says that he makes the GIFs with the same mentality as when he was doing street art. From the start he’s been trying to reach a broader public and make art that’s more than just art for the art world. Now as he’s making GIFs rather than installing wheatpastes and sculptures, General Howe’s goal is still the same, but he’s reaching out to the online public with fully digital, and easily sharable, artworks. A piece from General Howe’s “Disasters of War” series. Animation by General Howe.